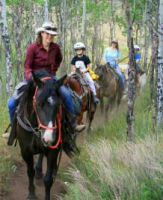 Horseback rides near Vail that are fun for the whole family! Enjoy the company of a knowledgable guide who will share with you the history of the land through which you ride. Catch glimpses of deer and elk in aspen groves and wildflower-covered meadows. The trail will be navigated by a beautiful, well-loved horse selected to fit your riding ability. Backcountry advanced horseback rides through the White River National Forest and Holy Cross Wilderness are also available. A true Rocky Mountain experience that is fun for the whole family. The Ranch is also available for group rides and events. Operated by Indian Summer Outfitters, Colorado Outfitter #2227, an equal opportunity service provider. Under special use permit by White River National Forest.